The Numark Mixtrack Pro II is the newly updated two-deck/two-channel entry-level digital DJ controller produced by Numark DJ Division that comes bundled with Serato DJ Intro. The original Numark Mixtrack Pro is one of the best-selling DJ controllers of all time and for very good reason. The overall layout of the Numark Mixtrack Pro II is fairly similar to the original Mixtrack Pro, but this time the Mixtrack Pro II has a much sleeker appearance, thinner jog wheels, and the very popular 16-pad setup to control the main DJ functions. Check out my full HD-Video review inside. The Numark Mixtrack Pro II is the newly updated two-deck/two-channel entry-level digital DJ controller produced by Numark DJ Division that comes bundled with Serato DJ Intro. The original Numark Mixtrack Pro is one of the best-selling DJ controllers of all time and for very good reason. Coming in at a low price-point, the original Numark Mixtrack Pro had some accurate jog wheels and a good feature set that allowed DJ’s to really get their feet wet in the realm of the Digital DJ. The overall layout of the Numark Mixtrack Pro II is fairly similar to the original Mixtrack Pro, but this time the Mixtrack Pro II has a much sleeker appearance, thinner jog wheels, and the very popular 16-pad setup to control the main DJ functions. 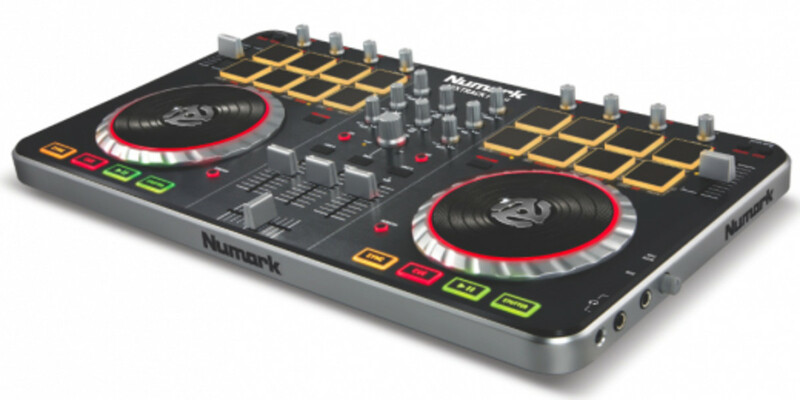 The Numark Mixtrack Pro II has a very compact and mostly plastic build-quality throughout. Despite the plastic construction, the Mixtrack Pro II feels sturdy all around and it feels like it will hold up through normal use. I would be careful during transport and make sure there is a bag or case protecting it when it’s not sitting on a desk or table. The overall compact size of the Mixtrack Pro II makes finding a bag or case rather easy as it’s about the same size as a Traktor Kontrol S2 or Vestax VCI-380. Mostly all of the buttons on the Mixtrack Pro II illuminate a very bright amber color to let the user know what is active at a glance. The transport buttons (Sync, Play-Pause, Stutter, Cue) are all hard plastic while the 16 rubber performance pads provide a good tactile feel and quick response for performing DJ&apos;s. The Numark Mixtrack Pro II does not come with a power supply and it must be connected to a computer at all times in order to run the unit with software. All of the lights are still very bright and the volumes of the headphone and RCA main outputs are adequate enough for live performance situations even while running off of only USB power. The Mixtrack Pro II is a fully MIDI-mappable DJ controller that can work with almost any DJ software out on the market today. For this review, we only tested the unit with the supplied Serato DJ Intro software package that comes with the controller, as this is what most users will end up using when they purchase the unit. If users want more control and a fuller DJ software experience, then DJ’s can upgrade to the full Serato DJ software for only $129 extra. This upgrade will give DJ’s more cue points, more sample banks, more effects, and much more in terms of control. At the time of writing this review, there were no available mappings for Traktor on the Numark website, so if someone wants to use the Mixtrack Pro II with different DJ software, then the mapping will have to be done manually. The setup of the Controller is very, very easy and intuitive. Inside the box, there is only a USB cable and a small paper printout that tells you to go to the Serato website and download Serato DJ Intro for your controller. Then it’s all just simple plug and play. You don’t have to load any drivers onto a Windows Machine as it will automatically load once you plug in the controller. Users don’t have to fiddle with any extra options or preferences either… It just works as soon as you plug it in and download the Serato DJ Intro file. Simply plug in your speakers through the supplied RCA outputs, plug in a headphone and microphone into the side panel of the unit and you’re ready to play your digital audio files through the software and the Mixtrack Pro II. There is only a single RCA output on the back to output your set. There are no additional outputs besides the headphone jacks located on the right side of the unit. There is a quarter-inch microphone input also located on the right side of the unit with its own dedicated volume knob as well. The Mixtrack Pro II has lots of the main features and functions that a DJ would want on-board for mixing and beatmatching. All of the knobs (EQ’s, Effects, etc.) have a plasticy feel to them but they allow for easy and adequate adjustments that always line up with the software. The three-band EQ knobs are FULL-KILL when completely turned down and they sound good overall. In the middle of the entire unit, there is an oversized Browse knob, back button, and a Load A and Load B button for file navigation and for loading new tracks onto the decks. 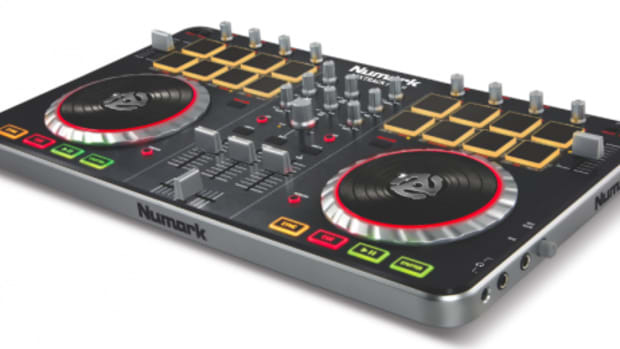 The Cue Gain and Cue/Mix controls for headphone monitoring are found in the middle of the Numark Mixtrack Pro II along with the two CUE buttons that are used to pre-listen to decks A and B before mixing live. The Crossfader feels like it is of average quality but really good for mixing and fading. The crossfader has a loose feel but it has a rather long cut-in distance which isn’t ideal for scratch DJ’s but after a bit of time, I was able to pull off a modest amount of scratching from a fader-perspective... The crossfader curve can be set to either Mix-Mode or Scratch-Mode by adjusting the crossfader curve knob on the front of the unit or within the Serato DJ software settings. The Line faders have much more resistance to them and they are good enough for nice and accurate mixing. In between the line faders is a master volume fader which is a cool change from most controllers who almost always use knobs for master volume control. There are no VU Line Level Meters or Gain knobs on the unit to make sure your music is at the correct levels. The only indicator you get as to the level of your track is through a small red on-screen indicator in Serato DJ that lets you know when the mix is at the limit. It would have been nice to have either full LED meters or a Gain knob to get the levels just right, but Serato DJ Intro does an adequate job of getting most of the levels even from the start. The eight rubberized performance pads found above each jog wheel are very nice indeed! These pads have nice feedback which makes DJ’s want to perform with them. These pads are not velocity-sensitive, nor do they light up different colors but they do a great job of indicating when something is active or inactive with its solid illumination. The top four pads are used for effects and autoloop lengths while the bottom four pads are used for the main playback and extra functions that DJ’s use during sets. The different modes that the bottom four pads can be in are Loop, Sample, and Cue. In order to cycle through the different modes of the bottom pads, the user must press and hold the shift key while pressing the appropriate pad to activate the particular mode. When in Loop Mode, the first two pads are Loop In and Loop Out, while the third pad is a reloop button and the fourth pad is used to grow or shrink the loop count. The top four pads will also act as autoloops when pressed along with the shift key. The first pad is 1-bar autoloop, second is 2-bar autoloop, third is 4-bar autoloop and the fourth is a 16-bar autoloop. When in Sample Mode, the four bottom pads correspond to the four sample decks within Serato DJ Intro that allow the DJ to trigger samples on the fly. When in Cue Mode, the first three pads are now hotcue triggers that can be set by pressing the button when the track is at the correct position and deleting them by holding the fourth pad and pressing the corresponding hotcue pad. The top four pads are used to activate and de-activate the three effects per deck. Simply press the pad to start the effect and press it again to turn it off. There are also parameter knobs above each of these pads to control the wet/dry of the effect that is currently applied. You are allowed to apply three pad effects at one time. The Jog wheels on the Numark Mixtrack Pro II are pretty good overall and seem to be just as good as the original jog Wheels found on the first Mixtrack Pro in terms of one-to-one operation. Overall, the jog wheels are very thin and only stick out about an inch from the top of the controller itself. They don’t really shake or wobble and they react well to the touch. The top is touch-sensitive plastic surface with a ribbed feel while the silver sides are used for nudging and slowing down the music for beatmatching. The Jog wheel performance for scratching is fairly decent for normal scratching techniques, but when doing super-quick movements with the jog wheel, I noticed that the software didn’t always keep up. The Jog wheels can be in either Scratch Mode or Mixing mode depending on the style of play that is favored. You can toggle between the two modes by pressing the Scratch button next to each Jog Wheel. The Tempo sliders work nicely for beatmatching and they have a good amount of tension to them and a center-click and LED indicator to let you know when you are at absolute zero. The tempo sliders are a bit on the small side, but they are accurate and you will get used to it with time. In Conclusion, The Numark Mixtrack Pro II is a very compact and lightweight controller with newly updated and sleek build quality and lots of easy-to-use features right out of the box. The Numark Mixtrack Pro II has one of the easiest setup procedures I have ever come across making this a great candidate for beginner or entry level users. The Mixtrack Pro II comes bundled with Serato DJ Intro and is fully MIDI mappable to any DJ software the user wishes to configure. The Numark Mixtrack Pro also has these cool and fun to use 16 Rubber Performance Pads that control Samples, Cues, Effects, and Loops. On the downside, there are no Gain knobs or Line Level Meters to show a DJ exactly where the volume of each track is while in the mix. It would have been nice to see one or the other in practice here, but Serato does a decent job of getting the levels right within the software. The Numark Mixtrack Pro II also has a limited number of inputs/outputs and an all-plastic construction which much be protected during transport to avoid any serious damage. Overall, the Numark Mixtrack Pro II is a welcomed (and successful) update to the previous Numark Mixtrack Pro, with the addition of the 16-performance pads and the sleek new updated look and feel make this a very worthy upgrade to the original. We are going to recommend the Numark Mixtrack Pro II Digital DJ controller to any new or beginner DJ’s who wants a sleek and compact unit with everything needed to start DJing right inside the box. The DJbooth.net Numark Mixtrack Pro II giveaway contest is complete and the winner has been announced. This was our first successful giveaway contest of 2013 and there will be many more to come starting next Month, so keep it locked! I want to give a special "Thank You" to all the DJ's and Producers out there who entered the contest followed back on twitter. Congratulations to Rick Stremmer of Connecticut for winning this contest! The new controller will be mailed to you directly from DJbooth.net within the next few days! The Numark Mixtrack Pro II is a great controllers for beginner DJ's or for those who want a minimal setup in a small and lightweight package. 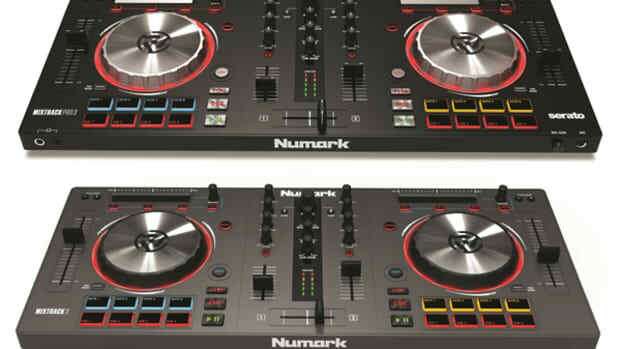 We recently reviewed the Numark Mixtrack Pro II and we really appreciated the new sleek look and 16 Performance pads. Now Numark has uploaded a new Tutorial video showing users the low-profile platters, transport/browser controls, secondary functions using shift button, Mixer, and the crossfader. Check out the tutorial and our review videos after the jump. 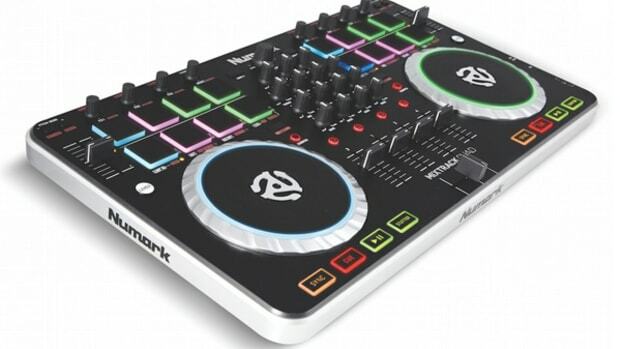 The Numark Mixtrack Pro II Digital DJ controller Free Giveaway Contest is NOW OPEN! We reviewed the all-new Numark Mixtrack Pro II last month and we found that it was a nice and compact controller with great jog wheels and faders that's housed within an all new sleek form-factor. We enjoyed the controller so much that we've decided to pass the love along to one lucky winner of our Numark Mixtrack Pro II Free Twitter Giveaway Contest. Rules and instructions to enter after the jump!